Brace yourselves for this, new Buffy fans: Buffy the Vampire Slayer wasn't only about vampires. There was a whole wide world of creepy and evil things lurking around Sunnydale. Buffy the Vampire Slayer Season 1 Episode 3 introduced us to our first enemy in the non-"dustable" category. We met an enemy witch, a future enemy witch, and our first hints of witchcraft. So much groundwork is being made here for the future. I love it! Get your episode ready. Let's rewatch "Witch"! Buffy wanting a normal life is a theme discussed a lot throughout the series. All she wants to do is be popular, go back to cheerleading and have no worries with her friends. Joining the Sunnydale High squad was her chance to relive her glory days. 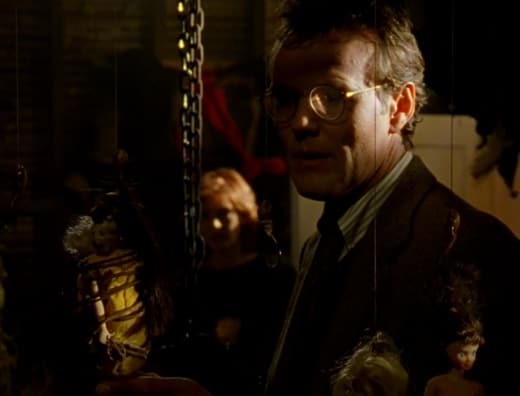 I love whenever Giles acts so incredulous early on about Buffy wanting a normal life. Especially when we learn about HIS backstory. Come on, Giles. Pot calling the kettle much! "Witch" is the first time we meet Amy Madison. Similar to Harmony in Buffy the Vampire Slayer Season 1 Episode 2, I couldn't believe a potential one-off/background character became a big part later on. Here, she's simply an aspiring cheerleader under her mother's thumb. But who knew there would be so much evil lurking there?! Even with the evil, she's still one of my favorite Sunnydale students/allies/villains. The buildup to Amber catching on fire added great tension. You knew something was off when the smoke started appearing as she danced. Sometimes shows go for the quick bang and get it out of the way, but "Witch" drew out the fire. And Cordelia's play on words made the moment. She's the queen. Kudos to the special effects team. For a show with a low budget at the time, they gave us both fake fire and real fire all in the same scene. I would never do the stunt work for a fire scene; there is just too much fear being caught on fire. Good job for the actress playing Amber for taking this on. Cordelia: Enough with the hyperbole. Permalink: Enough with the hyperbole. Did anyone else think Joyce failed epically during Buffy the Vampire Slayer Season 1 Episode 3? She had major "foot-in-mouth" syndrome. Everything she said and did to Buffy could not get any worse. It's like she already expected her to jump back on the wrong path. Joyce's progression in Buffy the Vampire Slayer Season 1 kept her as the stereotypical distracted parent. She relied a lot on self-help books to solve her issues, but she always held everything against Buffy. It's no wonder Buffy never shared anything. I'm happy to chat about Buffy the Vampire Slayer Season 2 as that's where Joyce starts to develop as a fully-fledged character with deep concern for Buffy. Joyce: Some of the best times I had in school were working on the yearbook. Buffy: Well, this just in, I’m not you. I’m into my own thing. Joyce: “Your own thing.” Whatever it is, got you kicked out of school and we had to move here to find a decent school that would take you. Joyce: Honey...Ugh. Great parenting form; a little shaky on the dismount. Permalink: Great parenting form; a little shaky on the dismount. After Cordelia threatened Amy in the locker room, I wasn't surprised she was the next victim of the witch. Cordelia, while amazing, is the typical mean girl. 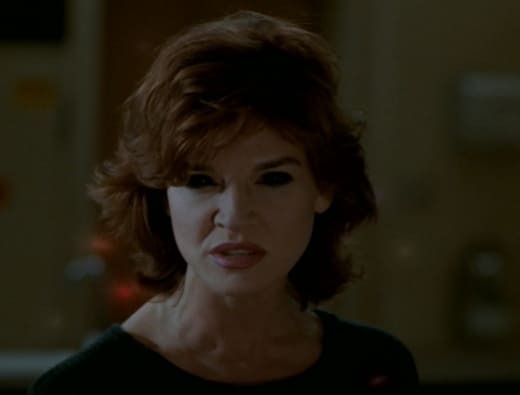 There's no doubt that someone at Sunnydale High wouldn't love to curse her and get their revenge on her. She was the perfect scapegoat, and it reaffirmed the witch was going after the cheerleaders. How was Cordelia able to see the oncoming truck? I mean, she lost her vision. She shouldn't be able to scream at it. This was a continuity issue that bugged me. She drove the car through the fence with barely any vision, but saw it enough to scream. Did she lose it after Buffy saved her life? Was it already gone? These are the questions that haunt me. First vampires, now witches. No wonder you can still afford a house in Sunnydale. Permalink: First vampires, now witches. No wonder you can still afford a house in Sunnydale. Beyond vampires, witchcraft and magic saw the biggest change in styling throughout Buffy the Vampire Slayer. In "Witch" we got bubbling cauldrons, hexes and incantations to perform spells. Basically stereotypical things we expect with any Halloween/horror element. However, all of this goes away once magic is incorporated more with the characters. I'm glad the styling change is made later on. Sure, it's more dramatic now, but it becomes tedious to perform any spell. A more seasoned witch is able to snap her fingers and make things happen. Wait...was Catherine a "ranked amatuer" witch? The third curse from the witch is possibly the most terrifying one. I can't imagine how Lishanne must've felt when her mouth disappeared. All of the curses, beyond Cordelia's blinding, could've caused death. Amber did nothing to Amy, but fire was a bit much. And Lishanne could've died with not having a mouth. But why did Amy look so shocked when the hex happened? And can we all agree Buffy was not smooth pulling the hair from Amy's bag? She completely gave that away. It's no wonder she's not an investigator. Buffy: You guys don’t have to get involved. Xander: What do you mean? We’re a team. Aren’t we a team? Willow: Yeah. You’re the Slayer, and we’re like the Slayerettes. Permalink: You’re the Slayer, and we’re like the Slayerettes. Seeing the Scoobies work together to investigate Amy brought back a lot of nostalgia. Buffy isn't only one person; she needs a team to get the job done. They each had their own strengths that help out in missions. Case in point: they were all used to solve this case. Though, her refusal to get her friends involved is another classic theme discussed throughout the series. Her friends are dedicated to do some good, but she doesn't want them harmed and constantly uses being a Slayer as the reason why. It can get a bit sanctimonious. I wish I could say this eases up over time. It doesn't. By numbers alone, Buffy became a cheerleader after Cordelia was blinded, correct? She was first alternate while Amy was third, so she only needed one person. Buffy in her wacky state was so much fun to watch. She not only came out to her mother as a vampire slayer, but she called Xander a girl and nearly hurt the cheerleading captain. Buffy needs to relax and let loose sometimes. Except for when it could kill her, of course. I still don't understand why the bracelet Xander gave her was an effective curse item. He just gave it to her and she didn't care much for it. Could any personal item work? Buffy discovering that Amy's mother Catherine switched bodies with her daughter perfectly showed how intuitive Buffy was. People may joke she's not the brightest or best student, but she has her wits. She caught on pretty quick. The big question I had for "Witch" was how many times did Catherine switch bodies with Amy? From the sounds of it, it started happening a few months before cheerleader tryouts. And then she just took over her daughter's body. Why didn't Catherine do the tryouts instead of Amy? She clearly wanted her daughter on the squad. She had the magic to switch bodies. This seems like a strange plot hole. Buffy: She switched...she switched your bodies, didn’t she? “Catherine”: She said I was wasting my youth...so she took it. Permalink: She said I was wasting my youth...so she took it. Giles's method to reverse Catherine's spell was too elaborate and long. Catherine had so much time to make her way to the lab from the gym. There's no doubt he could've stopped her before then. But I'm glad Buffy stopped her with the mirror bounce back. Catherine is a monster! Karma got her good for how vile she was to Amy. She brings a whole new meaning to living through your child. One treat we got from "Witch" was the screaming footage for the Buffy the Vampire Slayer opening credits. The Buffy opener tends to tease scenes that appear later in the season. But Buffy the Vampire Slayer Season 1 and Season 2 includes moments with sound animations. The first season had the screaming woman; Catherine attacked by the light was that woman. Who else loved Catherine's punishment twist? Trapped in the cheerleading trophy was karmic perfection. I don't think she had that in mind when cursing Buffy. Obviously, we know this is the last we'll see of Catherine (in person). But whatever did happen to the trophy? Personally, my theory is that it was destroyed in the roaring fire and explosion. But that's a discussion for a future rewatch. Buffy: So, this isn’t a vampire problem? Buffy: But this is funky, right? Not of the norm. Giles: Quite. Spontaneous human combustion is rare and scientifically unexplainable. There have been cases for hundreds of years. Usually all that’s left is a pile of ashes. Willow: That’s all that would’ve been left if it hadn’t been for Buffy. Xander: So, we have no idea what caused this? That’s a comfort. Giles: But that’s the thrill of living on the Hellmouth. There’s a veritable cornucopia of fiends and devils and ghouls to look at. Giles: Pardon me for finding the glass half full. Permalink: So, this isn’t a vampire problem? What did you think of "Witch"? Are you a fan of Amy? Was being trapped in a cheerleading trophy the worst punishment ever?